An ecommerce marketplace for alcohol, Drizly is helping local retailers sell and deliver drinks to customers’ doors. We speak to VP of Strategic Partnerships Taylor Burton to learn more. Soon, you might never have to pop to the corner shop for a four-pack again. 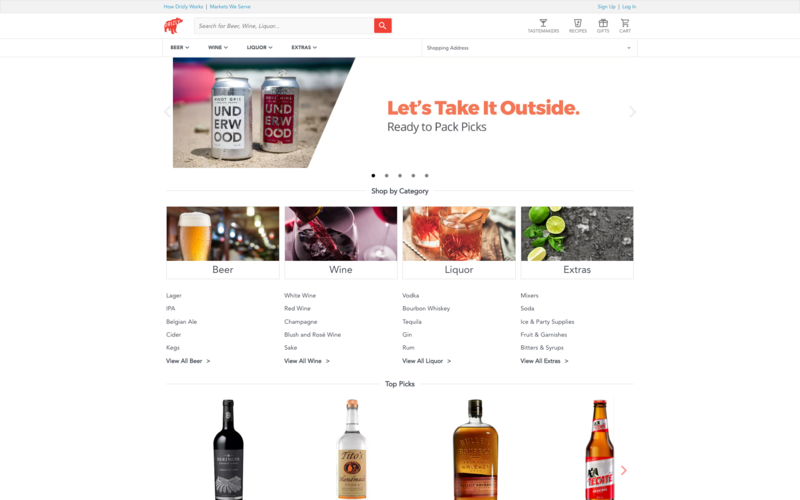 By partnering with local retailers, US startup Drizly is bringing beer, wine and spirits straight to people’s doors. It’s online platform acts as a marketplace, where thirsty customers can buy booze from local retailers. Those retail partners are then responsible for fulfilling each delivery. Drizly started out by offering alcohol on demand, but has since expanded its offering to give customers more choice between different delivery options and prices. To continue the conversation we began in New York, where he joined us for our latest Doors, Drones & Deliveries event, we speak to VP of Strategic Partnerships, Taylor Burton. He explains how Drizly is trying to fulfil its ambition to become the default ecommerce engine for the alcohol marketplace. Last year, Drizly shifted from offering only on demand delivery, to providing more flexibility and choice. Why? The bricks and mortar store is not broken. What we’re trying to do is add an extra layer of convenience to that experience. It’s about giving the customer what they want — when, where and how they want it. Convenience is very important to customers, but it doesn’t necessarily mean speed of delivery. Convenience could be click and collect in-store, or it could be gifting. We began by pushing on demand delivery as just one mechanic within our offering. But last mile delivery has become a race to the bottom in terms of pricing, so we’ve removed ourselves from that battle completely. For us, it’s about allowing the consumer to have a greater level of choice when it comes to buying, and we then rely on our store partners to deliver. What challenges did you encounter when turning Drizly into a marketplace that works with so many small businesses? To create an open marketplace, we’ve tapped into the POS systems of all our retail partners so that our customers have access to whatever products have been uploaded. This means they can shop across multiple stores’ inventory systems very easily. Currently, on demand alcohol ecommerce accounts for less than 0.5% of total alcohol sales in the US. By overlaying multiple choices for consumers, we significantly opened up our target market. That creates a new set of customers not just for us, but also for our retail partners. How do you introduce a sense of discovery, encouraging customers to try something new? The alcohol buying experience can be a bit intimidating, and people are not always comfortable asking questions. Some will make the time to ask for support, but mostly you just get in and get out, and hope you made the right choice! That’s where our editorial content and badges come in. We’ll let people know whether a product has been produced locally, we’ll share tasting notes, or highlight “staff picks” in the same way a physical store would. The challenge is to get the balance right between providing information, and making sure not to clutter the user experience and slow down the checkout process. Have you faced any challenges with last mile delivery? Companies that use third party delivery services can find it difficult to maintain quality control. Because our partners do delivery themselves, the customer receives the best experience. On our side, we support retailers with a driver-side app which also allows customers to track how far their delivery is. We’ve made sure there’s a forensic scanner too, so that stores have the best technology at hand to keep everything compliant.